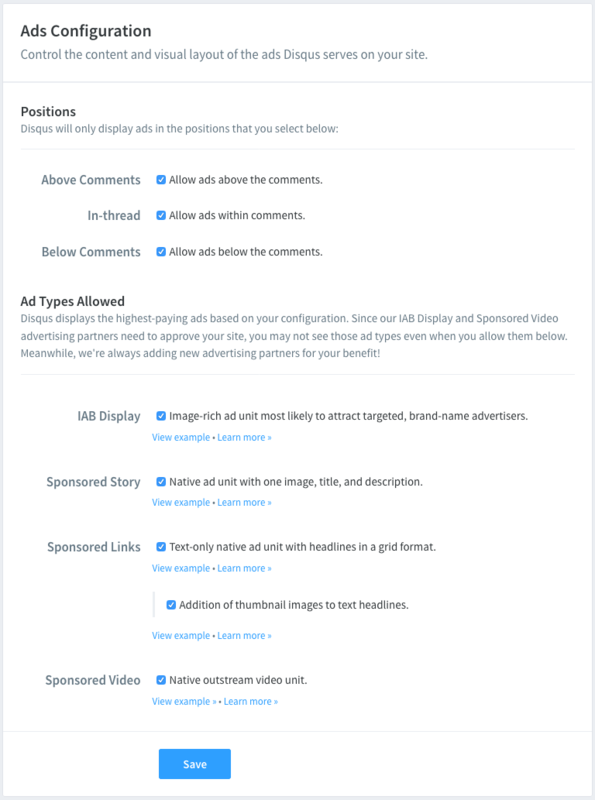 The Basic version of Disqus is ads supported, but you can easily control which ad types appear on your site by going to your ads settings. Click Settings from the top nav, and then select Ads on the left side of the page. You'll find a variety of settings that can be configured to fit the needs and appearance of your site. If you're logged into your moderator account, visit your Ads Settings page. If you have more than one forum, you may be prompted to select which forum you wish to see settings for. Here you can select the positions where ads display. By default, ads are enabled to display above the comments. You can also choose to display ads In-thread (within the comments) and below the comments. Above Comments: With this position, an ad will always display above the comments, whether it's a Sponsored Story (our default ad type) or Sponsored Links. In-thread Position: With this position, an ad will display within the comments on every page that has 4 or more parent level comments. Sponsored Story is the only ad type that this position supports, if Sponsored Story is not selected, In-thread ads will not display. Below Comments: With this position, an ad will always display below the comments whether it's a Sponsored Story (our default ad type) or Sponsored Links with Thumbnails. In the Enabled Positions Preview, you can see a preview of where ads will appear on your site based on your enabled positions selections. Reveal ads will automatically adapt to your site's color scheme and typography. If you'd like to adjust these settings yourself, you can manually update your site's appearance settings from the General Settings page. 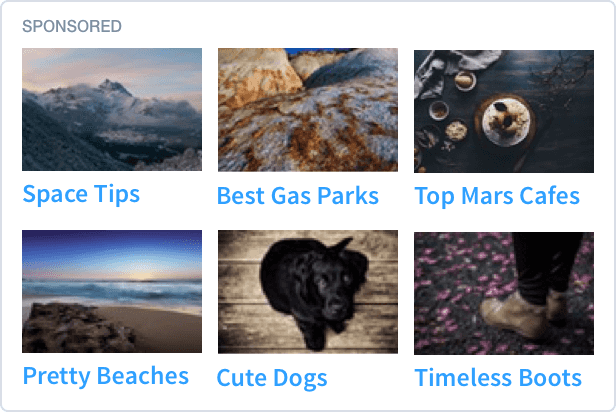 Remember to select a category for your site. This helps us to serve the more relevant ads to your audience based on your site’s content. The meter indicates your site's earnings potential based on your enabled positions and allowed ad types. Select all ad types and positions to ensure that the best ads are served to all of your readers and to maximize your earnings potential. The Above position and Sponsored Story ad type have the biggest impact, disabling these options will significantly decrease your earnings potential. Remember to fill out your payment information in order to receive payments from Disqus. Learn more about getting paid here. Advertising is a default part of the free version of Disqus. For sites where advertising is not a good fit, we have subscription options that include the ability to remove ads. If you're experiencing issues with quality, content, relevance, or any other ad-related issue, please contact our publisher success team.